#1 – Facebook is in flux. Although it continues to be easily the most prioritized social network for marketers at large, Facebook has become a source of quandary. That’s a remarkably even split, but the bottom line is this: more than half of marketers either agree or strongly agree that their organic reach has dropped since 2017. This comes as no surprise, since Facebook CEO Mark Zuckerberg has all but admitted that the platform is shifting feed prioritization away from branded content in favor of user-generated posts. Despite this, Facebook remains the most-utilized social channel for marketing with 94% penetration, nearly 30 percentage points above the next-highest, and 67% of respondents point to it as their most important platform. Facebook’s gargantuan active user base is impossible to ignore. We just need to get creative in finding ways to connect with people there, as only 49% of respondents feel their marketing is effective on the platform. Obviously, paid will play a major role; 67% of marketers plan on increasing their use of Facebook ads in the coming year. But, as TopRank Marketing’s Caitlin Burgess has written, influencer marketing also offers a path to capturing attention in the age of diminishing organic reach. And that’s an opportunity that fewer marketers are hip to, with 61% reporting that they are not working with influencers as part of their social media efforts. #2 – The ‘Gram is in. While Facebook continues to rule the roost, its prized subsidiary is most noticeably on the rise. Instagram is now the second most commonly used social media platform for marketers, jumping up from the No. 4 slot in 2017 with a 54% gain. Our own Josh Nite recently coined the term “hopping on the ‘gramwagon,” which I love, and there’s definitely a widespread movement in that direction. Two out of three marketers said they plan to boost their organic activities on Instagram in the next year, while 53% intend to increase their investment in ads on the platform. This makes sense given that 80% of marketers cited visual images – core to Instagram’s interface – as their most commonly used type of social media content and 32% said it was the single most important type, beating out blogging (27%), videos (24%) and live video (9%). Seeking to take advantage of its growing momentum, Instagram is in the process of rolling out several new features for businesses. As you might guess, Instagram is a more popular focus for the B2C cohort (72%) than B2B (57%), where LinkedIn remains the most prevalent non-Facebook option. Is it time for your business to jump on the ‘gramwagon? Not necessarily. Instagram has a sizable audience and some great features, but isn’t the right fit for every business type. Determining whether it’s a good fit will ultimately depend on who your ideal customer and audience is, as well as your business objectives and available team and budgetary resources. These insights and examples around Instagram marketing might help inform your decision. #3 – Video is the vision. The marketing community at large is taking a keen interest in the world of video. Fifty-eight percent of marketers said they plan to increase their YouTube organic activities in the next 12 months. And while only 24% of marketers currently peg video as the most important social media content type, 77% expressed an intention to grow their reliance on it going forward, topping the list. When asked which forms of content they wanted to learn more about, respondents chose video (77%) and live video (68%) above all others. The beauty of video is that it doesn’t follow a linear format. You can and should experiment to find the right format for your message and audience’s tastes, as well as to match what you’re trying to accomplish at different stages of the funnel. If you’re among those eager to learn more about video, our team recently shared some tips for first-time video marketers. And if you’re already exploring this tactic, our Annie Leuman shared examples of brands connecting with audiences through long-form video. #4 – What about bots? Facebook Messenger first launched an API for bots back in 2016, but there still aren’t too many marketers wading into this pool. Only 15% of respondents said they’re currently using Facebook Messenger bots as part of their marketing mix. 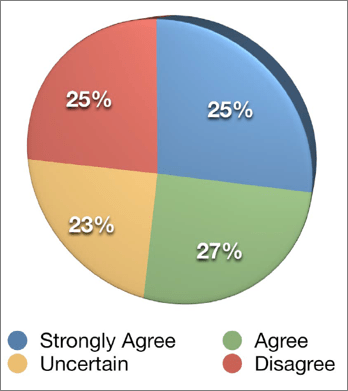 However, 51% said they plan to include this tactic in future marketing. One does wonder, however, if such plans will be altered by Facebook’s maneuvers to restore faith amid privacy concerns. The company quietly paused the ability of developers to add new chatbots in the wake of the Cambridge Analytica scandal. To provide some recognizable context, this blog post does a nice job laying out the similarities and differences between email and messenger bots. #5 – Measurement moving forward. Here at TopRank Marketing, we’re big on concrete reporting and analytics, so we’re glad to see 44% of marketers now stating that they’re able to measure ROI from social media activities, up from 38% last year. That’s still less than half, and only 10% strongly agreed, so there remains considerable room for improvement. Incidentally, Seb Joseph wrote earlier this month at Digiday that advertisers questioning ROI might be Facebook’s biggest threat. Most of the major social platforms have deep measurement functionality that you might not be utilizing. Make sure to explore back-end dashboards and pinpoint metrics that align with your objectives. Additionally, Sprout Social compiled a list of the best social media analytics tools of 2018. The constantly changing dynamics of social media marketing make it an especially challenging landscape to navigate, but the sheer number of users and level of activity make it one that none of us operating in the digital world can afford to ignore. While the latest Social Media Marketing Industry report points to several areas of of uncertainty and shortcoming, it also shows that marketers are moving in the right direction when it comes to grasping ROI, embracing video, and diversifying their strategies. Hopefully the tips we’ve provided here can help you with these initiatives. While its standing is still impressively strong, I’ll be curious to see if Facebook loses its dominant footing in the year ahead, and how other players might pivot to take advantage. Want to read the full report? Head on over to Social Media Examiner. Looking for additional social media insights, trends, and tips? Peruse our lineup of recent social media marketing blog posts. 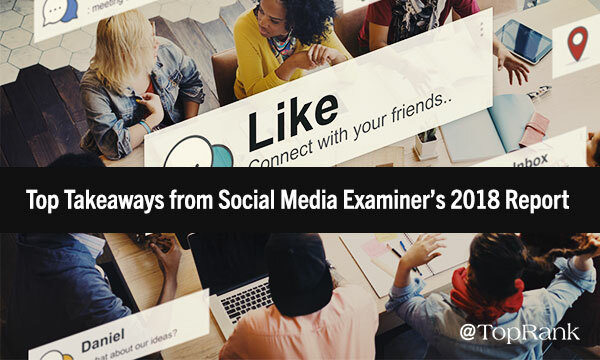 The post From Messenger Bots to the Growth of ‘Gram, Social Media Examiner’s Annual Report Reveals Trends to Watch appeared first on Online Marketing Blog – TopRank®.